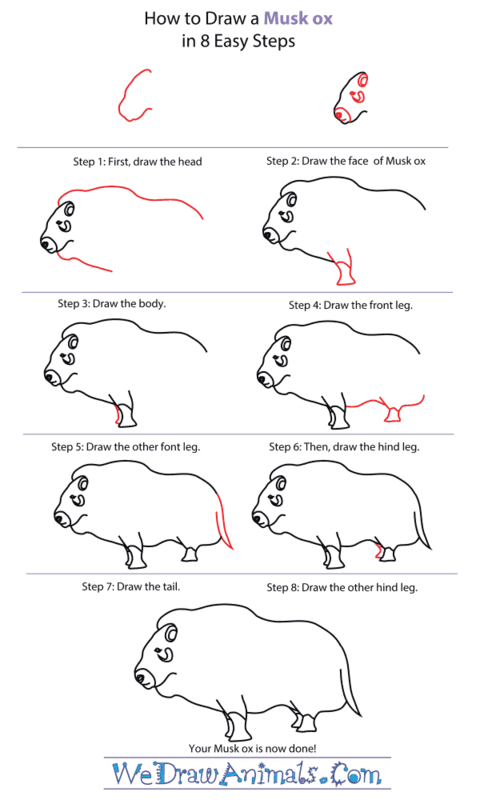 In this quick tutorial you'll learn how to draw a Musk Ox in 8 easy steps - great for kids and novice artists. 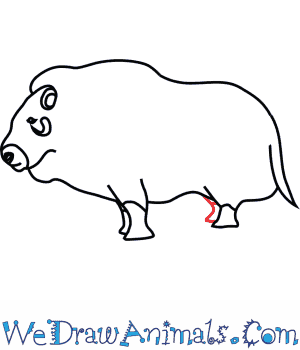 At the bottom you can read some interesting facts about the Musk Ox. 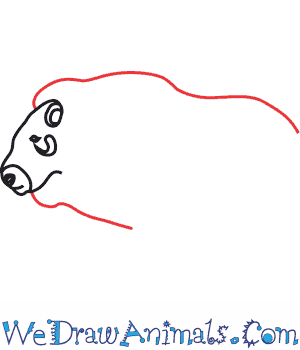 Step 1: First, draw the head as shown above, leaving a gap for the neck and body. 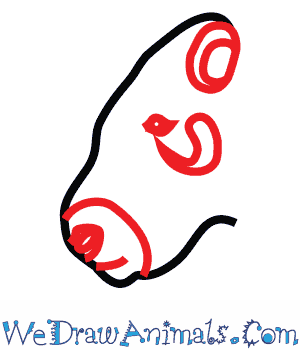 Step 2: Draw a tiny oval for the eye, a hook shape for the horn, a semi-circle inside of an oval for the ear, a small line for the mouth, and a small circle for the nose Add a curved line going across near the bottom of the head. 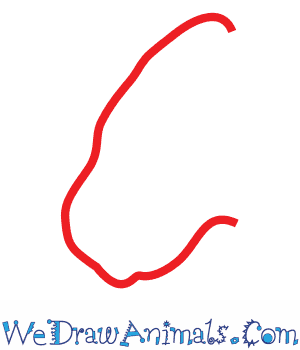 Step 3: Draw the body by creating two wavy lines starting at the top and bottom of the head. Try to think of a cloud when making the lines. Step 4: Draw the front leg with two vertical lines that curve in and then out, then use one more line to make them meet. Step 5: The other front leg will be mostly hidden by the first one, but add a line curved just like the left side of the first front leg. Step 6: Draw the bottom of the body, then make the hind leg like the first front leg you drew except a bit smaller. Step 7: Draw the tail using two lines from the right of the body that meet at a point. Step 8: Make the other hind leg like the first, except that the right half of it will be hidden by the other hind leg. 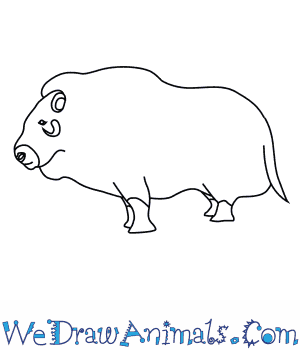 Your Musk Ox is now done! Musk oxen are large mammals that weigh about 600 to 900 pounds. They have thick layers of dark brown fur that is so long that it almost touches the ground. Their massive size and layered fur helps them survive the freezing cold. Musk oxen are from the Arctic Tundra, specifically northern Canada, parts of Alaska, and Greenland. Musk oxen are about 5 feet tall at their shoulders and are about 8 feet long. Musk oxen live for 20 to 25 years. 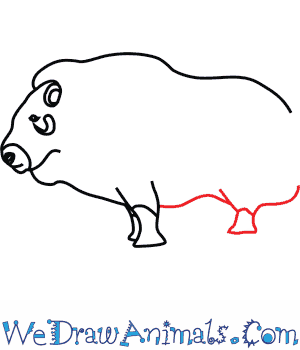 Musk oxen are herbivores. They eat various kinds of plants, flowers, and grasses. They have large hooves that help them dig through the snow to find their food. Musk oxen are related to sheep and goats. Musk oxen are sometimes also called musk sheep, although they look more like buffalos. Musk oxen live in herds with up to 100 members. They travel in a large group to protect each other from predators. Both male and female musk oxen have downward-curved horns. Musk oxen used to be hunted freely by humans, until Canadian law banned people from hunting them for sport. Their population was almost extinct until the 1910s, when the law was put in place. Musk oxen are most often used to make wool items such as scarves.